Linn Energy is highly distressed due to the bearish investor climate towards energy and high yield investments. Linn Energy has a significant asset base that would likely make debt investors whole when investing in the notes at current prices of 35 cents on the dollar. Linn Energy is deploying capital with the highest ROI: buying back its distressed debt. Through creative financial engineering, Linn Energy has positioned itself to potentially maintain oil production without further debt financing, increasing the likelihood of averting default. 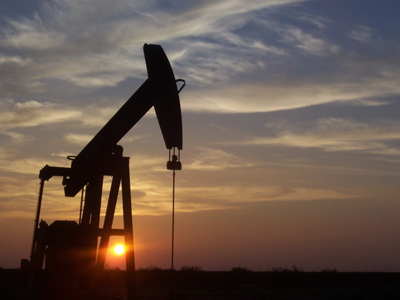 Linn Energy is an independent oil & gas exploration & production (E&P) firm operating across the United States. As an investment product, it is treated by investors as a widely traded upstream Master Limited Partnership (MLP). MLPs are income pass-through entities that typically house oil infrastructure and pay a regular cash distribution to investors with no corporate income tax. The entity must pass most of its income to investors and so MLPs are typically debt heavy to fund growth. Investors of MLPs are typically seeking income rather than growth as the entity does not retain significant cash to grow. Linn Energy is not actually an MLP. Investors access Linn Energy through two publicly traded entities: 1) a tax-advantaged LLC called Linn Energy, LLC with ticker LINE on NASDAQ and 2) a subsidiary LLC called LinnCo, LLC with ticker LNCO on NASDAQ that behaves like a C-Corporation. Unlike an MLP, LINE has neither a general partner nor incentive distribution rights (IDRs). Unit holders have voting rights, receive distributions on a monthly rather than quarterly basis, and file a Schedule K-1 for tax reporting. Linn Energy sold additional equity under the LinnCo entity to appeal to an investor base that prefers a more streamlined tax reporting process: receiving Form 1099 rather than Schedule K-1, have no state income tax filing requirements, and no unrelated business taxable income (UBTI) implications. LinnCo is taxed at the corporate level and pays quarterly dividends. Key Takeaway: One could say that the management of Linn Energy is quite adept in financial engineering. Linn Energy's equity and debt have sold off tremendously with the 2015 collapse in oil prices. LINE and LNCO have suspended their cash distributions to equity holders. Technical sell-off: Investors who held LINE and LNCO typically invest for income. Such investors sold the stocks after the suspension of cash flow to equity holders because LINE and LNCO no longer meet the needs of their portfolios. With little investor demand, Linn Energy is limited in its ability to raise capital in the equity markets. Fundamental sell-off: Since MLP-type businesses must fund their growth via debt, Linn Energy is a highly leveraged business in an industry with collapsing prices. Although the company hedged its commodity price risk, it is in danger of illiquidity because high yield investors are stepping away from capital markets and there are doubts that Linn Energy can roll over its debt. Key Takeaway: Linn Energy's problems aren't just low oil prices--it needs to be able to rollover its debt in 2019 when notes are due. Linn Energy has $10.3 billion of long-term debt outstanding and the 6 1/2 May ’19 notes are the first notes to mature. The notes are junior to a Linn Credit Facility ($2 billion drawdown), Term Loan ($500 million), and Berry Credit Facility ($1.17 billion drawdown) that are secured by mortgages on 80% of the total value of oil and gas properties included in Linn Energy’s most recent reserve reports. There is approximately $3.67 billion of secured claims (described above) that would enjoy a higher priority to the notes. There is approximately $6.07 billion of senior unsecured debt (including the notes) that would enjoy equivalent priority of claims. As of June 30, 2015, Linn Energy’s oil and gas properties were valued at $12.45 billion (based on successful efforts method). 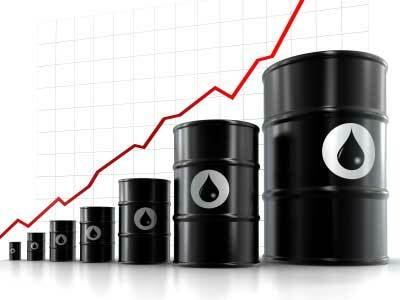 Even with a significant decline in oil and gas prices, the 80% mortgage is more than adequate to make whole the creditors of the Linn Credit Facility, Term Loan, and Berry Credit Facility. Additionally, Linn Energy has $1.6 billion in hedging derivatives that would only become more valuable in an environment that would push the firm into reorganization or liquidation. Assuming the value of Linn Energy’s oil and gas properties fall 40% (due to commodity price declines and depletion), the portfolio would be worth $7.47 billion. Adding the derivatives portfolio at today’s value of $1.6 billion (it would likely be worth more in the event of Linn Energy’s default), there would be $9.07 billion of assets. Deducting the $3.67 billion in secured claims leaves $5.4 billion residual for senior unsecured claims. This would be 89% recovery, more than covering current prices at 35%. Key Takeaway: Senior unsecured is the fulcrum security. It is also an option with limited downside and asymmetric upside. 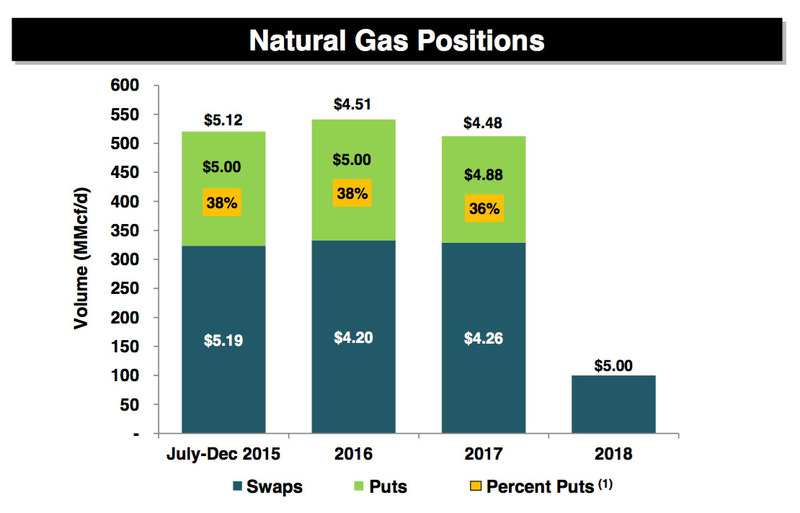 Linn Energy is 100% hedged for natural gas through 2017 with hedges averaging $4.51 for 2016 and $4.48 for 2017. 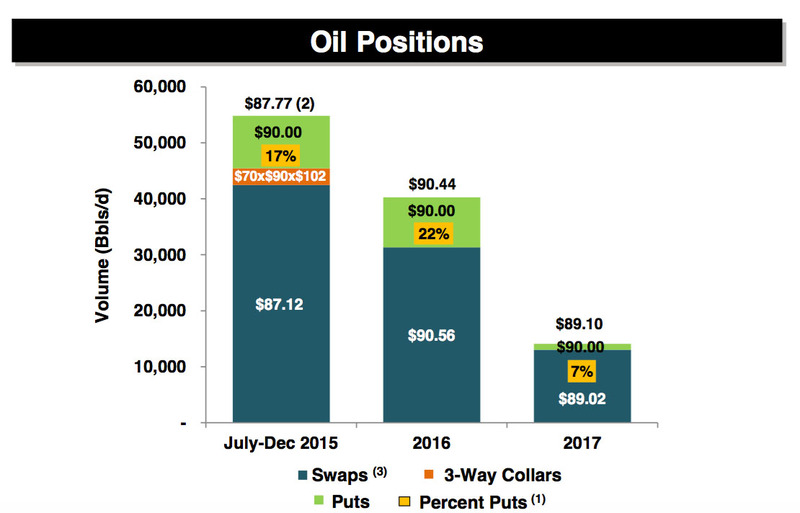 Linn Energy is 70% hedged for oil in 2016 with hedges averaging $90.44 and roughly 30% hedged for oil in 2017 with hedges averaging $89.10. Operating cash flow was $299 million (net of hedges) for the three months ending June 30, 2014 in which weighted average price of oil was $52.65 per barrel for Linn Energy. The price of oil has been lower this past quarter but Linn Energy is hedged. Management expects to generate $200 million in FCF over the remainder of 2015. Linn Energy has eliminated its distribution to equity, retaining approximately $36 million per month for operations and debt service. Interest coverage ratio (EBIT/Interest) is 3.84 and current ratio is 1.97. In 2014, Linn Energy fully repaid its higher interest variable loans of $2.3 billion. Linn Energy also repaid $206 million in senior notes and repaid $2.3 billion in the Linn Credit Facility. In the first seven months of 2015, Linn Energy has repurchased $783 million of its senior debt at a 29% discount to par, which translates into a 50% ROI. Key Takeaway: Management is actively managing its balance sheet, which favors creditors. AcqCo is a partnership with Quantum Energy Partners for acquisitions. Quantum provides up to $1 billion of equity to finance property acquisitions. Linn Energy provides management services with G&A reimbursements and promotes. 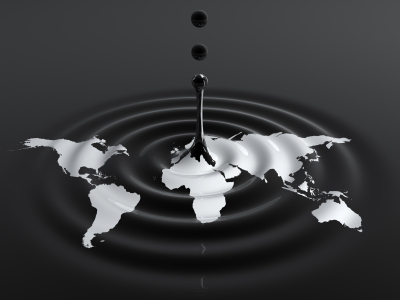 DrillCo is a partnership with GSO Capital Partners (Blackstone) for drilling. GSO provides up to $500 million of equity to finance drilling programs operated by Linn Energy. Linn Energy has a 15% carried interest in the projects with a promote to 95% once a 15% IRR is achieved. Key Takeaway: Linn Energy can fund capex and potentially maintain production without new debt. Many firms will exit the industry because they are ineffective operators that spend high capex due to low success rates in drilling wells. In year ending December 31, 2014, Linn drilled 559 wells with 99% success rate. In six months ending June 30, 2014, Linn drilled 468 wells with 99% success rate. Linn’s reserve has an average life of 17 years, with 80% classified as developed. Linn’s projects are more mature fields with low drop off rates in production. Key Takeaway: Linn Energy requires less capex to maintain production. Linn Energy is taking steps to avert default by retaining cash and reducing debt. If the firm survives, the 6 1/2 May 2019 notes will yield nearly 44% per annum. If the firm defaults, residual value recoverable for senior unsecured claims is more than adequate if the note is acquired at current prices of 35 cents on the dollar. Key Takeaway: Buy the 6 1/2 May 2019 notes and consider hedging by shorting the common equity.